If you would like to read or download our Service Brochure, click on this picture. Information, Food Assistance, Child & Adult Groups & Services, Community Events, Computer Lessons, Free Counselling, Energy Account assistance (EAPA), Equipment (PCs, Laundry Facilities & Lawnmower). BBNC is currently funded by NSW Family & Community Services under the Community Builders Program, which aims to make communities stronger as a way of reducing inequality and disadvantage (see more about the Community Builders Program below). We provide a place where people can meet and access resources. We also support workshops, training, events and activities held at the Centre by other local services and groups. BBNC aims to be inclusive, and to provide as much support as possible to people needing assistance. 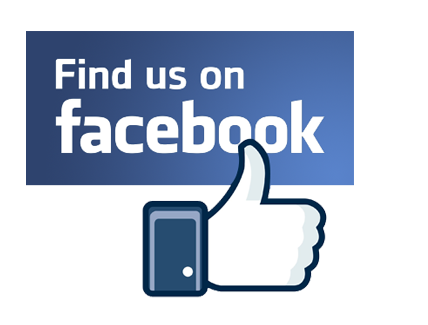 You will find out more about our Services on our Services Page. To find out about our Activities, go to our Activities Page. A google location map is accessible from our Contact BBNC Page. Bateau Bay Neighbourhood Centre (BBNC) opened its doors to the community in January 1991 as Cynthia Street Neighbourhood Centre (CSNC) after the Berkeley Vale Neighbourhood Centre Inc was successful in obtaining funding for the Centre through the Central Coast Area Assistance Scheme. Its primary aim was to assess the local needs in the area and find avenues to meet those needs. From January 1996, CSNC was able to establish on-going funding for Before and After School care and Vacation Care programs (which they no longer auspice), as well as to provide support and a venue for individuals and groups from Tumbi Umbi, Bateau Bay, Killarney Vale and Forresters Beach. In late 2010 CSNC transitioned into the NSW Government Human Services Community Services Community Builders funding program, which aims to enable communities to address disadvantage by providing opportunities for people to engage in a wide variety of social, economic, cultural, recreational, learning and civic activities. 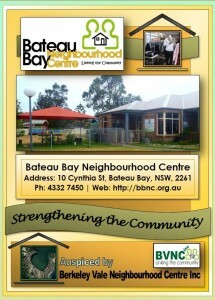 In 2013 the Centre changed its name from Cynthia St Neighbourhood Centre to Bateau Bay Neighbourhood Centre. It is auspiced by the Berkeley Vale Neighbourhood Centre Inc (the BVNC Inc, see more below). Bateau Bay Neighbourhood Centre (as well as Berkeley Vale Neighbourhood Centre, which is also auspiced by BVNC Inc – see below) is funded under the NSW FACS Targeted Early Intervention (TEI) Program. 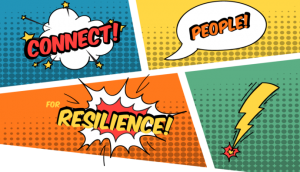 Service delivery under TEI is aimed at children, young people, families and communities who are potentially vulnerable or have known vulnerabilities, including those experiencing crisis. In late 2010 BVNC Inc, on behalf of Berkeley Vale Neighbourhood Centre and Bateau Bay Neighbourhood Centre, entered the NSW Government Department of Human Services Community Services Community Builders funding program. Consistently with Community Builders funding priorities, our two Neighbourhood Centres have aimed to provide a capacity-building community resource which connects people to information, services, and each other. We have sought to build community resilience and to improve safety, security and well-being in our local areas. Our Centres have also provided venues and facilities for a range of community-based, non-profit services and activities for local community members, including information, workshops and assistance provided by visiting agencies at our Centres. Our Service priorities have evolved, and continue to evolve, under current Government policy priorities and funding guidelines, as well as in response to changes in local conditions and in community expectations. We are currently funded under the Community Strengthening stream of FACS’ Targeted Early Intervention model of service priorities and accountabilities. More information about Community Builders, Targeted Early Intervention and the Community Strengthening stream can be found below. Bateau Bay Neighbourhood Centre (as well as Berkeley Vale Neighbourhood Centre, which is also auspiced by BVNC Inc – see below) is funded under the NSW FACS Targeted Early Intervention Program. The TEI Program was developed to complement the FACS early intervention service system. 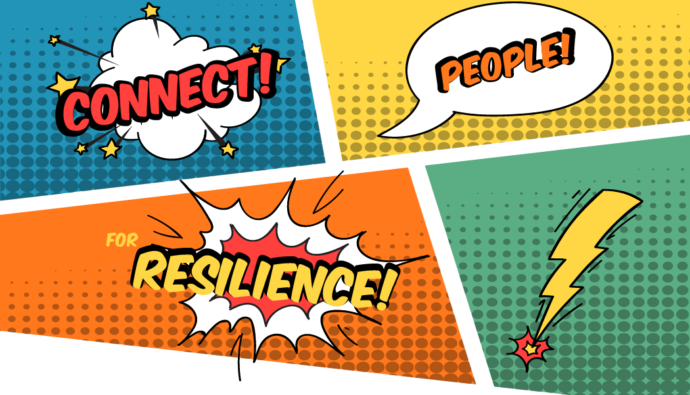 Service delivery under TEI is aimed at children, young people, families and communities who are potentially vulnerable or have known vulnerabilities, including those experiencing crisis. The Community Strengthening stream of TEI aims to connect disadvantaged or excluded members of the community with the broader community. This is done by improving access to fundamental material and social resources. Fundamental resources include adequate housing, health care, employment, education, support or financial resources. Another way to strengthen communities is by enabling socially isolated people to be part of community social activities and events. In addition, we can promote and enable collective involvement with community issues and opportunities. Provision of a Community Centre – providing a place to meet, interact, volunteer, or seek help or support. This may include provision of meeting space, sponsorship/support for forums, groups and programs (including parent, youth, early childhood), and access to equipment and technology such as computers, software and internet etc. 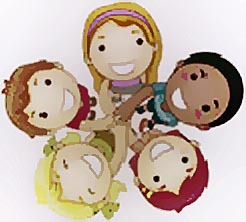 Development of Community Connections – building social capital and networks, promoting social inclusion, tolerance and diversity. This may include sponsorship/support of events, workshops, art and cultural or community activities etc.. Provision of Community Support – providing programs to improve individual capacity (knowledge, skills, experience, confidence and well-being), social inclusion and participation. This may include sponsorship/support of training, workshops, activities that provide community support, and provision of volunteer opportunities etc.. Provision of Targeted Support – providing assistance for people in specific categories of disadvantage or difficulty (e.g. domestic violence, social/economic disadvantage). This may include sponsorship/support of counselling, parenting or family groups or programs, playgroups, youth or child care activities etc. 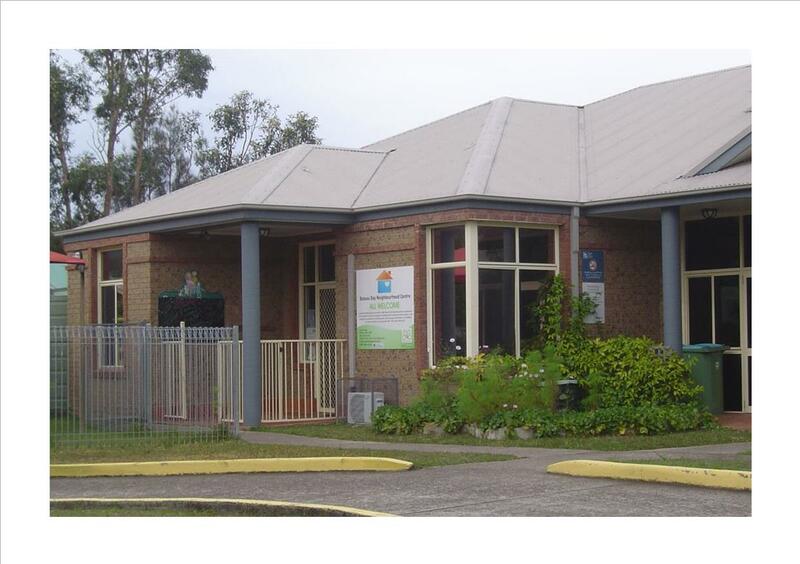 Tuggerah Out of School Hours Care Centre, Tuggerah Public School, 1 Pacific Hwy, Tuggerah. 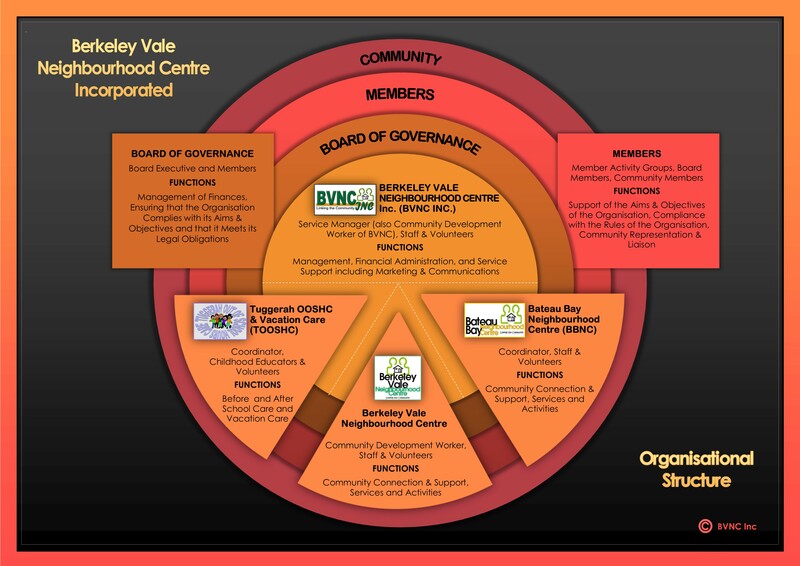 More information about the BVNC Inc, BVNC Inc Membership, and the BVNC Inc Board of Governance is available at the Berkeley Vale Neighbourhood Centre website at bvnc.org.au. BBNC is auspiced by Berkeley Vale Neighbourhood Centre Incorporated. To be a member, you have to apply and be approved by the BVNC Inc Board of Governance. Memberships run from 1st January to 31st December of the current year. You can become a member at any time throughout the year. The yearly cost is $2.20. If you are applying to join a group at BBNC, you will need a member of that group to sponsor you. Read more about membership on the Membership page of the BVNC website. You will be able to download a printable membership form from there, OR Complete an online form. If you have any enquiries, get in touch with us and we will be happy to help you. The Registered Charity Tick is intended to help the public instantly identify a registered charity, and encourage them to visit the Charity Register listing.